How was your reading in the month of June? Did you find something new and wonderful, or did you revisit a childhood favorite? It was a month full of possibility with the potential for a lot of fun. Let us know how it went for you! 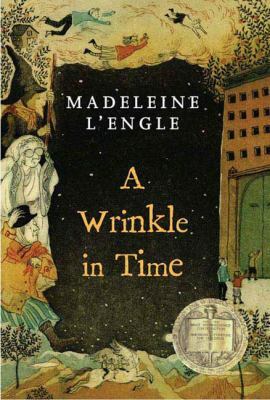 This month I went with a children’s classic, A Wrinkle in Time by Madelaine L’Engle. Winner of the Newbery Medal in 1963 (the Newbery is awarded each year to the best children’s book in writing), this is a dramatic adventure story filled with alien creatures, distant planets and fantastical imagery. It’s also a story on a more intimate level – the value of friends and family, loyalty, accepting others as they are, being courageous and, most of all, the power of love. Meg’s father has been missing for many months and she feels his absence keenly. She doesn’t know what has happened to him, only that he was working on something called a tesseract and no on can explain where he’s gone. When her little brother Charles Wallace introduces her to three strange women living in the woods behind their house, it sets them, along with their friend Calvin, on an incredible journey. While I enjoyed this book – there’s quite a lot of action and even some scary bits where you just want to know what happens – I think I would have liked it even more if I had read it when I was a kid. Maybe my imagination is too “stuck” now to let go with the flights of fancy described here, or maybe I’m just not scientifically inclined (this book really celebrates math and the sciences). I did love Meg and how brave she was, even when she didn’t feel brave. She’s a young teen, at that awkward and unsure stage, but she’s smart and she’s strong. A role model for anyone. What did you read this month? What did you think of your choice? Let us know in the comments! I read “Beautiful Joe” which is a childhood favorite of my mother’s. It was such a sweet story told from the perspective a dog who had been abused by a previous owner but is now totally loved by Miss Laura and her family. I loved it! For June I started out reading The Dawn Country for the challenge. It felt like cheating a bit, since it is actually the second book in the series I read for the the previous month! The main characters are children, so I figured it fit the prompt! The Dawn Country picked up where the People of the Longhouse left off. Loved it, and the story felt more complete with the second volume. I’m starting the third in the series, but not sure if I’ll stick with it. It’s a slow start, and takes place 12 summers later. It might be an abandoned book for now. Since it seemed a little shady to simply read on for the June challenge I picked up Hold Fast by Blue Balliett. In this J Fic title a young girl’s father goes missing and it becomes quite the mystery to find him again. Set in Chicago, we are carried away on a journey that includes a stay in the homeless shelter system and more than a little time spent in the Chicago Public Library, where the missing father worked.